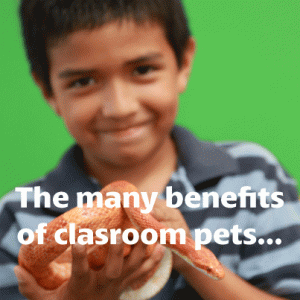 We asked teachers what the best reasons to have a classroom pet were and wanted to share some answers with you! My favorite thing about having a class pet is that I have noticed kids who would never choose to socialize and interact in free time will get in groups and talk and laugh over something the guinea pig did or pet and play with her. My 24th “student” is the best peacemaker and behavior manager ever! The connections the kids make with the pets! I work in a classroom for children with autism and the friendship they have made with our pet is amazing. They talk to him when they are upset and read out loud to him! Their growth is so exciting to see. Breaking down prejudices! I have two rats and several of my students were adamantly against rats, because “they’re gross, miss!” And now they’re begging to see them and commenting on how big they’re getting and how cute they are. The best thing about having a classroom pet is the interest, ownership, and increase in responsibility that the students exhibit! Plus pets are just cool!!! My students are learning to care for other living things. They show him attention and respect. It is an awesome experience for me and my students. It is very therapeutic for our kids with special needs.